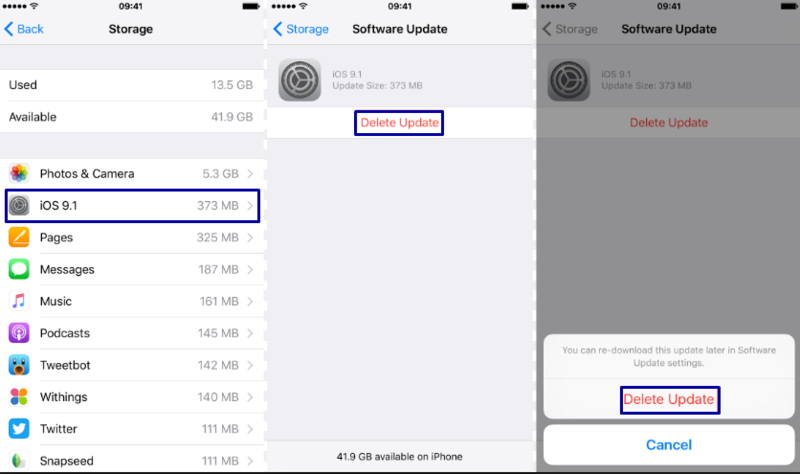 How to Delete Updates On iPhone – The iOS updates don’t seem like what all people appreciate. The larger space needed for the updates makes them think twice to do it. Moreover, with the updates notification that prompts you the most which are really bothering. Thus, people seek how to delete updates on iPhone. The updates are aimed so that your iPhone better performance. It will fix the bugs and bring your phone new features. However, the updates annoy you the most more like a bug every morning. Don’t worry, you come to the right place, and here are how to delete updates on iPhone. The ways you delete updates for these versions are different with iOS 11. There some steps that you need to follow. Firstly, go to the “Settings” app. After that, tap the “General” menu. Next, “Storage & iCloud Usage “. This menu is only available in these versions. Then, tap “Manage Storage”. Don’t forget to locate the nagging iOS software update and select it. This is also an important step to do. Finally, before confirming that you want to delete the updates, select “Delete Update”. Well, after doing all the steps above, the iOS updates will not worry you any more. Moreover, these ways of how to delete updates on iPhone help you to be free from the updates. On the other hands, you can still download the software update if you want to. You just need to go to “Settings” then select “General” and tap “Sofware Update”. Did you think that deleting the iOS updates in these versions same like the previous versions? Then, you were wrong. There are some different steps that you need to do for these new versions which are iOS 11 and later. These following steps are all that you need to do. Firstly, go to the “Settings” app. This first step works the same like the previous versions. See too How to Reset iPhone 6s Without iTunes. Then, select “iPhone Storage” in general’s menu. Whereas in the previous versions you have “Manage Storage”. After that, you will see there are all the apps that already listed there including the iOS software update. At last, click on the iOS update and then tap “Delete Update” to confirm that you to delete the updates. Those all the steps that you have to do to delete the iOS updates on your iPhone. These ways of how to delete updates on iPhones will help you to be more relax and not worry again. However, many people have this problem with their iPhone where they want to delete the updates, but they can’t. The problem usually come because they don’t see the option that they should use. Well, in the steps above, you could delete the updates by considering which version of iPhone that you use. This is really helpful where not all iPhone versions have the same listed menu. Moreover, after deleting the iOS updates, you will no longer receive the iOS update reminder. It doesn’t matter whether you connect to the Wi-Fi or not, the reminder will not come. Now regain more megabytes space in your iPhone and say bye for the updates.